Founder and director of UCF RESTORES estimates the new center could treat up to 100 patients in clinic's first year. The large community of military veterans in Brevard County now has a new cutting-edge resource for treating post-traumatic stress disorder. The Rosengren Trauma Clinic at UCF RESTORES, which launched on UCF’s campus in 2011 with a unique approach to treating PTSD, has opened another clinic in Brevard County. The UCF RESTORES Brevard PTSD Clinic is now open at UCF’s regional campus in Cocoa at Eastern Florida State College. Brevard County has more than 65,400 veterans, according to the U.S. Census. In the clinic’s first year, Beidel estimates the new center could treat up to 100 patients. Treatment is free, thanks to state funding and community support of the clinic. Most recently, RESTORES celebrated a $1 million donation from veteran and alumnus Jim Rosengren and his wife, Julia, whom the clinic is named after. They were inspired to donate to the clinic after their son received help with his PTSD that developed after two tours in Iraq. RESTORES combines exposure therapy and group therapy sessions to treat patients in an intensive, three-week outpatient format. 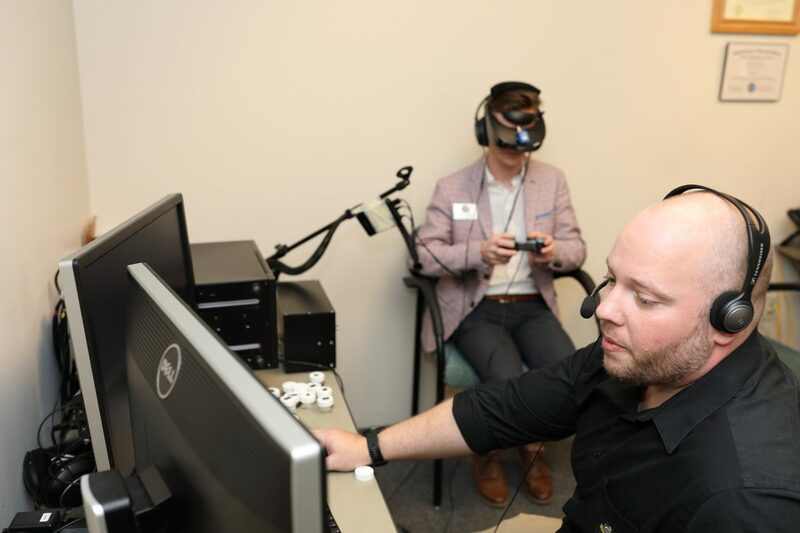 Through virtual reality, patients are exposed to triggers that have contributed to their PTSD. It follows the simple theory that in order to get over a fear of dogs, one must be around a dog, said Beidel. The group-therapy portion of treatment includes sessions on anger management, depression, sleep hygiene and more. Since its launch, RESTORES has treated more than 450 veterans and active-duty personnel from all conflicts, military and civilian sexual trauma, and has expanded to also treat first responders from 20 states and survivors of mass shootings, including at Pulse nightclub in Orlando. The clinic in Brevard will also offer these expanded services, including treating first responders and civilians who have suffered other traumas such as sexual assault. For more on UCF RESTORES and its services, visit www.ucfrestores.org.